With facts, figures and such. When I mistakenly believe my creative world has dried up after too much study, or Life Interruptis, it calls to me from the very depths. As I burn out, and become incommunicado, I look for a route out of this overwhelmed state. Then I have the insatiable desire to eat color with my eyes and disappear into a non-linear place. It doesn’t let up till I grab some pastels and paper, and dive right in. To my relief I rediscover that this world where I reconnect, not only reforms me into a functional human being, but has actually waited quite patiently for my return . A sketch is only the beginning, an open-ended jumping point to other interesting places. It’s a go-with-the-flow moment that entices the artist along, taking stock of the the world at the moment from the inside out point of view. When I sit, my sketchpad in front of me, grasping lightly onto a pen or pencil, I try to see my object. Try this: with a piece of paper try to draw with your hand, don’t look at what you’re drawing, and don’t pick up your pen. Let it be one fluid movement. Then look down at what you have created. I noticed that drawing is an art anyone can learn. It’s relaxing and don’t worry that you’ve never done it before. Don’t stress about being perfect or you can’t draw without a ruler–I don’t either. All you need is your eyes. No two eyes see the the same object in quite the same way. An amazing thing happens the longer you draw. You will start to notice things around you differently and will wonder why you never did before. The world around you becomes a richer place. Have you ever tried to draw anything? What do you experience? But with all our relations. Recently I pulled a book from my shelf that’s been there for years. I can’t remember where I got it, and never bothered to venture into it, till recently that is. In it the author explains to the reader that certain words have no equivalent in Native American language. Words such as: waste, guilt, should, it, we, them, us, forget, could, free. But, rather, it is rich in terms of relationships and individualism. I wonder if we didn’t believe we were separate as we are brought up to believe, but were connected to everything: the earth, every human, animal, plant, etc., would there still be as much senseless war, oppression, and destruction of the environment? 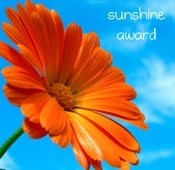 http://laurenmichelleotheim.wordpress.com/for nominating me for the Sunshine Award! I’m really honored you enjoyed my poetry that much! For hosting this poetry slam! Let the nominees know they have received this award by commenting on their blogs. http://laurenmichelleotheim.wordpress.com/ what can I say. I really like your poems too! I love what happens as I start writing. The pen moves across the page, and if I believe in magic, something magical happens. It turns into something besides the experience, turns me inside out, changes me. They alert me to lampposts lit till day. Click my heels and head for home? Hinting of a direction to go? That I just never noticed? Sometimes a better direction is clear, but we’re too preoccupied with plans. We’re not open to surprises from the universe, and it ends up taking a 2×4 to get our attention. Is it supposed to be this difficult? At the drawing of day. I wrote this when the last of the fall leaves crunched beneath my feet on my little walks. I noticed thousands of acorns blanketing the ground and remembered that that predicts snowy weather. I mentally prepared myself for what was to come. Aside from the fact I can breathe better in winter, I don’t really care for it. I love the sun, but don’t worship it, and relish a garden to play in. While it is blizzarding outside my door, its quiet. Millions of individual ice crystals are filling every nook and cranny, insulating all the exposed parts of my door and windows, and the house is less drafty. Everyone else is huddled comfortably inside, no doubt imbibing hot chocolate, enjoying cups of homemade soup, or involved in this or that. I watch it like an old movie, look forward to spring, and the brightly colored wash of things that grow. I have that ability, as we all do, to manifest what I believe. I must take care not to be negative because my thoughts solidify at light speed. But, if I am positive, a lot of cool little things happen. Yesterday, I won a small door prize, was treated to a movie, and won some gas money from a scratch ticket. Normally, I would brush these things off as if they meant nothing. Lately, I have been grateful for them. I know they will turn into more significant things simply because I did notice. We need what a poet can scribe. Oh, only a poet would know. Lest peered through poet’s eyes. As necessary as food, or water is a poet. No one should be allowed to move through life without reading it. It reminds us of who we are, not what we do. At the beginning and end of the day, we are human beings. And besides the security, and love we all require, we need a sacred place in our hearts around which everything else revolves–poetry. In the new midday light. How is it to be alive in a world always on the edge of enlightenment or destruction? Living in the thick of it, surviving from day to day, it means to look for more. We internalize the outside world, then try to demystify it and discover some inherent meaning. That’s how an artist is hardwired. Honing our craft, the world vanishes for a while; we go into a world of our choice. After reaching our deepest selves, we emerge healed and whole on the other side. Then it all seems to make a strange kind of sense. We’ve actually salvaged our humanity from the wrecking block. If we deviate from the truth of who we are, we are absolutely lost and miserable. Once we’ve gotten past the excuses and procrastinating, it’s still there waiting as if we never left.